Fashion mogul and designer Karl Lagerfeld has realized that the adult coloring book fad isn’t going away any time soon. But instead of cashing in with his own line of coloring books, he’s collaborated with Faber-Castell on a set of colored pencils that will set you back $2,850. Come again? The KarlBox, which is designed to look like a Chinese wedding chest, features a silhouette of Lagerfeld under the lid which probably accounts for $2,500 of its price tag. 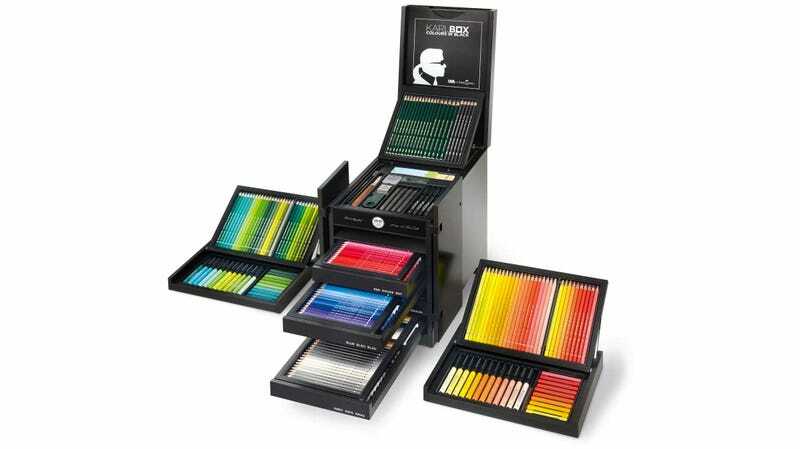 The rest gets you 350 different tools for sketching, drawing, coloring, and painting, including the 120-piece Faber-Castell Albrecht Dürer line which is apparently what the famous designer prefers. Only 2,500 of the sets are being created, available at a limited number of shops right now, but with additional retailers stocking it come mid-September.